JEFF MAYWEATHER: "I'VE BEEN TALKING TO FLOYD AND THERE IS A POSSIBILITY OF A FIGHT"
"Right now, I'm kind of just talking to them and they are working to basically get a letter of intent for the fight to possibly take place. But of course we gotta talk numbers and things like that for anything to happen. I gotta talk to Lil Floyd to see what he is looking to get. I'm negotiating with both sides and it's just a matter now of sending a letter of intent to Manny and one to Floyd through me and see where it can go. To me, it's a major event in terms of not just Floyd fighting Manny Pacquiao, but to be involved in a historical event," stated world-class trainer Jeff Mayweather as he talked about Floyd Mayweather's possible return to the ring later this year. Check out what else he had to say about his nephew, Manny Pacquiao, Mike Jones, Nonito Donaire, Mickey Bey and much more. PC: How is everything going Jeff? JM: All is well. I have to say this before we keep going because my partner, my team member's with me. We have a new website that I have to mention called www.proboxinginsider.com. That's gonna be my new website. It will be out soon. PC: I will mention your website as long as you still show FightHype.com some love (laughing). JM: (Laughing) Okay, not a problem! PC: Your guy, Mickey Bey, just suffered the first blemish on his record as he fought to a draw on the Donaire/Montiel undercard. What are your thoughts on the fight and the outcome? JM: I thought that he performed well. I thought he should have moved his head a little bit more. We actually talked about strategy. I watched footage of the guy and I knew he was durable and tough and aggressive. I felt that at some point in time during the fight, the guy was going to force Mickey to fight him. I still thought Mickey beat the guy fairly easy. The guy landed some big shots, but at the same time, Mickey landed way more shots and also landed some big shots as well. I think that the one judge that had Mickey winning 6 rounds to 2 had it right. PC: Being that Mickey is a young fighter suffering his first blemish, I'm sure you want to get him right back in the ring to erase this memory for him. JM: As much as I want him to get right back in, right now, he's having hand problems. He broke his hand in the last fight and then it happened again in this fight, but he didn't break it though. He actually hurt both hands, so right now, that's our biggest dilemma is to just get his hands healed and hopefully the next time out, he won't have the same issues. PC: What did you think about the rest of the card, Jones/Soto-Karass and Montiel/Donaire? JM: I think Mike Jones did what he needed to do to win the fight. He used solid boxing. I don't know if he showed that he could go to the next level, even though he beat that guy. He should have fought that guy like that the first time and it should have gone that way the first time. I thought he actually lost the first time, but good for him; he got a chance to erase that blemish. It's one of those situations with him where I take my hat off to him. He made the best out of getting a second chance. And of course the Donaire fight was awesome. I mean, I commend both of them, not just Donaire because he won, but to see Montiel show all of the heart and grit in the world and still try to continue to fight after he was basically knocked out already. PC: The referee in that fight took some heat for letting the fight continue. If that was your fighter, would you have let that fight go on after the way Montiel went down? JM: It was one of those situations, from what I seen, where I was at, I was at ringside and what I saw is that he really hurt him and then he got up to beat the count. He fought with everything he could to get up and when he got up, he looked as if he was conscious enough to throw punches back. At the same time, he had already been hurt so badly that your instincts are to cover up and not throw punches when you've been hurt that bad. I wouldn't criticize the referee for giving him a second chance. He was a proven world champion and one thing about boxing is that one punch can change everything. People don't realize that. 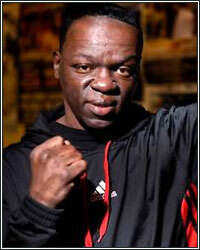 Look at John Tate when he fought Mike Weaver. Weaver got beat for 14 rounds and 30 seconds and then turned around and knocked the man out and became heavyweight champion of the world. You can never say never because a lot of times, when a guy has his guy hurt, sometimes they rush in there and the guy throws a punch and the fighter that's winning or dominated could have the tide turn. That punch catching him with the force of him coming in thinking that he's about to close the show is enough to get himself knocked out. PC: Did you walk away thinking Donaire is going to be tough to beat at 118? JM: I thought he was the real deal even before the fight because I had seen him fight a couple of times. He is very tall, he's got good boxing skills, and he's got good punching power. I think that the's about to blow up now. He's following in the footsteps of Pacquiao and Pacquiao put the Philippines on the map in the boxing world. So now it's Donaire's time. It's almost like he's going to pass the torch to represent Filipino boxing. PC: I know you have been excited about this big heavyweight you have coming up next month. How has he been looking? JM: He's looking good. I actually picked up Khali Meehan too and I'm supposed to pick up another guy from South Africa. I don't know his name yet, but he's supposed to be in a position to fight for a #1 spot for the WBA jr. welterweight title. I got a lot going on, but I finally got the heavyweights name that you're talking about. I still don't know how to say it, but his name is Cojanu Razyan Andrei. PC: Do you think we will see your nephew, Floyd Mayweather Jr., inside of the ring before the year is out? JM: Um, I've been talking to Floyd and there is a possibility of a fight, but I don't know yet. I know that he is talking to Nelson Mandela's daughter because they are trying to put together something for his 93rd Birthday. He is a big fan of boxing and a big fan of the Mayweathers and he wants something to be a part of his birthday celebration and things like that. Of course, in the midst of that, they're also trying to make the fight between Floyd and Manny. Right now, I'm kind of just talking to them and they are working to basically get a letter of intent for the fight to possibly take place. But of course we gotta talk numbers and things like that for anything to happen. I gotta talk to Lil Floyd to see what he is looking to get. I'm negotiating with both sides and it's just a matter now of sending a letter of intent to Manny and one to Floyd through me and see where it can go. To me, it's a major event in terms of not just Floyd fighting Manny Pacquiao, but to be involved in a historical event in terms of it being done with Mandela. You have physically two of the most powerful black men that you see and Mandela is definitely one of them, Obama, and then after that, you would probably say Colin Powell, so to be a part of an event like that is really a big deal. To be invited to Mandela's birthday is phenomenal to me, so hopefully...I still gotta talk to Floyd and find out exactly what he wants and things like that and see if we can make it happen.